Reviving another beloved character he’s known for – Harrison Ford is completely invested in this role and his chemistry with Gosling is essential to some key plot points that make ‘Blade Runner 2049’ even more significant as a sequel. In fact, it goes a step further to enhance the original, making all the questions raised there even more relevant. This justifies an elongated runtime that would get tedious if it wasn’t so gorgeous to look at. Admittedly, this will completely go over your head if you haven’t watched the original but if you liked it, you simply cannot afford to miss ‘Blade Runner 2049’. The best thing about the film is how Villeneuve and his writers Hampton Fancher and Michael Green lead us expertly into the mystery and begin to uncover said mystery in drips, making you piece together the puzzle. There’s a prevalent sense of something sinister going on, a darker force at work and secrets lingering everywhere K turns.Watch it on the biggest screen possible the soonest you can. Blade Runner 2049 is bold, challenging cinema, an almost Biblical success; like Terence Malick’s The Tree of Life, Martin Scorsese’s Silence, and Nolan’s Interstellar, it positively demands multiple viewings.This is an artist working at the pinnacle of his powers. 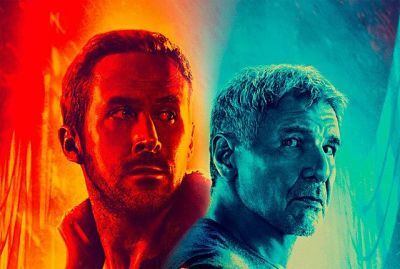 It is several artists working at the pinnacle of their powers – Villeneuve, Gosling, even Hans Zimmer – they’ve all come together to create something quite unforgettable. But they’ve also achieved the unthinkable: They’ve birthed a sequel that eclipses its parent. .
Deakins and Villeneuve don’t use a green screen for effects, they prefer to have sets and that makes it much more involving. The CGI is un-obtrusively spectacular. From the fluctuating holographic interfaces, to the flying cars, to the dystopian backwaters it’s visually so stunning that you just can’t take your eyes away from it. The sound design also allows for thunderous impact. Hans Zimmer’s achy background score adds weight to the intense and richly hued engagement. In 3D Imax the experience is altogether out of this world. This is a potential Oscar Goldmine even in terms of performance and probably the best ever sequel of an original iconic film, made.